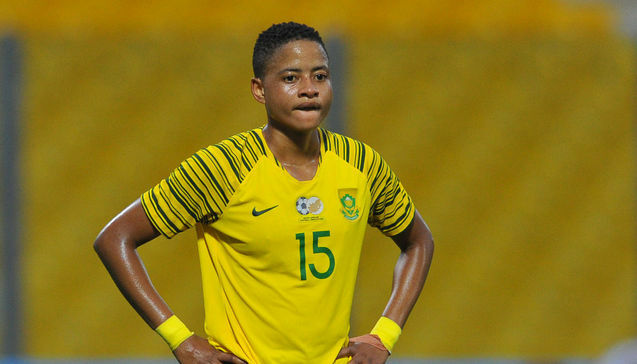 Banyana Banyana vice-captain Refiloe Jane will miss the Women’s AFCON final against Nigeria at Accra Sports Stadium in Ghana on Saturday due to club commitments. Yeah, it’s sad that I won’t be in the final against Nigeria even though a part of me still wants to play, but also a part of me still needs to go and live my other dream of playing pro football overseas. It’s not an easy task to be done, but it is the perk (sic) of being an athlete you know. Sometimes God places you in situations knowing what’s best for you. Even though I want to be here, he placed me here but I should be somewhere else. So wherever he places me to I will go. And I met with the team, I sent my goodbye messages and informed them I won’t be available for the final. But we’ve got quality players in the team; we’ve got what it takes to lift the trophy whether I’m here or not. And also I want to thank the technical team for allowing me to leave at this crucial point of the tournament. If it was any other coach I don’t think it would be easy for them to just say, ‘you can leave’ while we are going to play a crucial match in the tournament, which is the final. But all that, I need to say thank you to the team and thank you to everyone who gave me an opportunity to be here, and also to Canberra for allowing me to come and also compete in the AFCON tournament.